Practicing a few gentle yoga poses can help lengthen tight muscles and release tension while you travel. Remember, staying present with your feelings and looking for opportunities to stretch will allow you to incorporate yoga for travel into your itinerary. Wear comfortable clothes that you can move around in easily. Being the yoga and comfort enthusiast that I am I wear my yoga pants everywhere. I might layer on a skirt, long shirt, or sweater, but I am always ready to stop, drop, and do yoga! Travel Yoga Mats Are Great. I have a few travel mats, and I can name many surprising places that they have fit into during my travels: the outside pocket of my already crammed full suitcase, my purse, and in my laptop case. I know that if I have my travel mat, I can make any place work. Remember that anything is better than nothing! Stay present with how you are feeling and look for opportunities to stretch. This will allow you to take advantage of opportunities as they arise. As you might do in your regular practice, work on those areas that call for your attention. It is normal to feel weird when practicing in public. Remember, you’re doing this to benefit your health and keep your body moving. Maybe you will end up inspiring others to get up and move when they see you taking care of yourself! Choose the poses you need. There are so many options for opening up the areas that tend to get tight during travel, especially the lower back, hips, legs, shoulders, and neck. Choose the ones that correspond to your body’s needs, or if you have time, practice all of them as a sequence. Wrists and Hands / Feet and Ankles Inhale and extend arms out from your shoulders and parallel with the floor, with hands closed into fists. Exhale as you move your wrists up and down, and then rotate in a circular motion one way and then another. Inhale as you point one foot and exhale as you flex the same foot. Next, rotate your foot one direction and then the other. Move to the other leg and repeat. Shoulder Shrug Inhale and raise your shoulders upward as if you were trying to touch your ears. As you exhale, roll shoulders backward and down. Shrug your shoulders as high as possible and try to keep your elbows fully extended, only moving from the shoulders. Side Stretch Begin by siting tall with arms relaxed. As you inhale, raise your arms overhead with palms facing. Lean your torso to the right and open your chest toward the ceiling, and then take your gaze upward. Repeat the stretch on the other side. Eagle Arms Extend your arms straight in front of your body. Drop your right arm under your left. Bend your elbows, and then raise your forearms perpendicular to the floor. Wrap your arms and hands, and then press your palms together (or as close as you can get them.) If your palms don’t touch, press the backs of your hands together. Lift your elbows and reach your fingertips toward the ceiling. Keep your shoulder blades pressed down your back toward your waist. If your palms don’t touch, press the backs of your hands together. Seated Cat-Cow Sit near the front of the chair or bench, with your feet hip-distance apart and planted firmly under your knees. Place your hands on your knees and sit tall. As you inhale, rock your hips forward tilting your pelvis. Lift your heart forward and up and at the same time, roll your shoulder blades down your back. Allow your head and neck to lengthen out and back, coming into a gentle backbend. As you exhale rock your pelvis in the opposite direction onto the back part of your sitting bones. Round the spine and drop the chin toward the chest. Repeat both poses, flowing with your breath the entire time. Seated Twist Sit toward the front of your seat, with your feet hip-distance apart and directly under your knees. Ground through your feet and sitting bones. Inhale as you extend your spine upward, sitting tall. Place your left palm on top of your right knee. Place your right hand on the seat behind your right hip to prop yourself up. As you inhale, extend your spine upward. As you exhale, twist your torso and head to the right. Once complete, move to the other side. Seated Forward Fold Sit toward the front of your seat. Separate your feet so that your knees are more than hip distance apart directly over your ankles. Place your hands on your knees. As you inhale, sit tall. As you exhale, begin to extend your heart forward as you come into the forward fold with a straight back. When you reach your maximum extension, allow your spine to round forward and bring your arms between your legs. If you have tight hips or lower back issues place your elbows on your knees and come forward to your edge. To come out, place your hands on your knees and come up on an inhalation, keeping your back relaxed. Seated Forward Fold With Leg Crossed Start by sitting toward the front of the chair seat, with your feet hip-distance apart and directly under your knees. Ground through your feet and sitting bones. Extend your spine upward, sitting tall. Cross your left foot and ankle over top of your right leg just behind the knee. As you inhale, lengthen the spine up away from the hip. As you exhale, extend your heart forward until you reach your edge. Let the head and neck release. When complete, inhale as you rise and as you exhale, release the crossed leg and move to the other side. Standing Forward Fold Stand tall with feet hip distance apart and arms by your side. Inhale your arms out and up, bringing palms together. As you exhale, extend your heart forward, hinging at the hips. Bend the knees enough to find your edge with the backs of your legs. Let your arms reach to the floor or feet, dangle them in front of you, or place them on your thighs for lower back support. To release, bend the knees, keeping the back straight. Inhale and sweep your arms out and up, coming back to standing. You will need more standing space and your travel mat (or an acceptably clean space.) 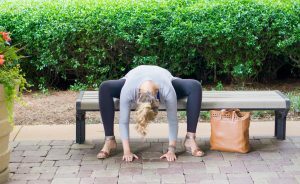 Practice these poses as many times as you need to feel energized. Downward Dog Twist Come to all fours with your hands under your shoulders and your knees under your hips. Spread your fingers wide and curl your toes. Straighten your legs as you lift up through the hips. Reach your left hand to the outer edge of your right leg. Spiral your ribcage to your right, Hold your arm straight. Gaze under your right arm. Repeat on the other side. Triangle Find a comfortable heel-to-arch alignment. Turn your left foot to face forward. Shift your hips in the opposite direction. Lift your arms to shoulder height, extend through your fingertips, and then reach the left arm forward to your edge. Float your hand down to your shin or ankle. Raise your right arm toward the sky, stack your shoulders, and lean your torso back. Repeat the stretch on the other side. Dolphin Start on all fours. Lower your forearms onto the floor shoulder-width apart. Curl your toes and straighten your legs any amount. Keep your shoulders over your elbows as you walk your feet forward to deepen the stretch. Camel Kneel with shins hip-width apart and hips stacked over knees. Place your hands on your lower back. Lift your belly and curl your chest open. Roll your shoulders back and gently release your head back while pressing your chest toward the sky. If possible, reach your hands to your heels. Yoga for travel is fun! Moving and letting go of tension and tightness that builds up on long trips in tight places is essential. Yoga for travel helps you keep your energy up and stay healthy during your trip. Incorporating yoga into long travel days can make a real difference in how well you travel, which can make you open to more travel opportunities!